The meeting this month was a painting day. These days are enjoyable with a chance to see what other members are doing, chat and exchange ideas and there is always plenty of tea and coffee plus cakes and biscuits. 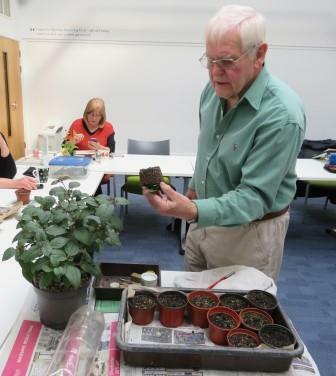 Also this month we were given a masterclass in plant propagation by society member Brian Haycocks. Brian demonstrated how to take cuttings from a parent plant. We learnt how to select the material from the parent also that the roots of fuchsias grow from the base of the stem of the cutting but when propagating chrysanthemums the stem of the cutting must be cut below the leaf node and the bottom leaves removed before putting the cutting into the compost. Brian provided all the equipment and compost we needed. Next month we will see how well our cuttings have rooted. Society member Celia Scottow has an exhibition of her Botanical Art at the Canalside Heritage Centre, Beeston. The exhibition is on now and until the 1st May. Information on our new course is on the web site. ‘Steps through Botanical Art’ replaces the ‘Aspects’ course. The course will run from Spring to Autumn and will begin in 2020 from March until October. 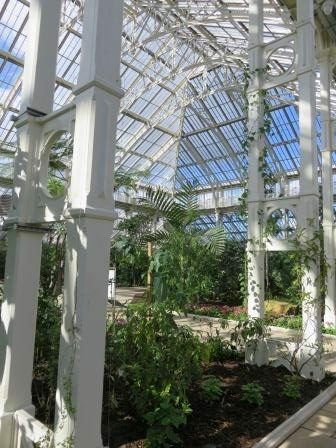 On Thursday 14th March members and friends travelled to Kew Gardens. After heavy rain on the journey the skies cleared and it was a lovely afternoon. The gardens were looking spectacular with daffodils interspersed with blue scilla and beautiful magnolia trees in blossom. The conservatories contained lovely plant material with lots of flowers (Temperate House shown). The object for most was to view the exhibitions at the Shirley Sherwood Gallery. The Japanese orchid wood block prints were very colourful and it was interesting to see in the display cases the tools and techniques used to produce these. The collection of art by Pandora Sellars was inspirational especially the helpful descriptions about each image and how the effects were achieved. It was also lovely to see her paintbox containing 60 pans of ready made paint mainly in the colours red, green, brown and yellow. The Mark Frith collection of 20 large (1.7 m wide) graphite drawings of ancient oak trees was to be impressed. Finally – ‘Trees – delight in the detail’ It was interesting to see up close the originals of paintings only previously seen in books. Grateful thanks to Martin Allen who gave us a workshop on 17th March. Martin started with a Powerpoint presentation on ‘Wall Appeal’ which included discussion of the composition of some of the images shown and also where the focus of attention occured. This was followed by taking us out of our comfort zones looking at techniques for edges (sharp, soft and blurred). It was then our turn to have a go at softening the edges of our paintings. A thought provoking workshop. The society outing to Kew on 14th March. The programme for this year is complete with the additions of a demonstration on propagating Fuchsias and a two mini workshops,one on making books – a useful way to use spare pieces of watercolour or cartridge paper and one on how to use gold or other transfer metals as a background to a painting. There is still time until 28th February 2019 to submit images for inclusion to the SBA exhibition which takes place in June. A One Day Botanical Workshop with Jeni Neale – Shades of Spring on Saturday 23rd March, 10am – 4.30pm. This is at Compton Verney, a museum and art gallery situated 9 miles from Stratford-on-Avon. It is on the B4086 between Wellesbourne and Kineton. Book on line or call 01926 645500, all places must be booked. On the 25th January 2019 The Society of Botanical Artists (SBA) published a list of their new Fellow members. Congratulations are sent by the committee and members of this society to Celia Scottow, Adrienne Roberts and Jane Wilkes for gaining Fellowship of the SBA. This is a major achievement. Look at the SBA Facebook page to see an image of Fig leaves by Celia Scottow, Eryngium by Jane Wilkes and two from Adrienne Roberts Hyacinths and Peony. 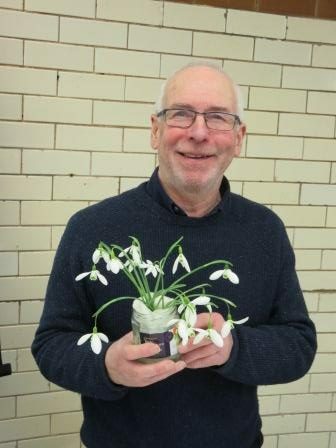 A different event for the first meet of 2019, we were given a talk on ‘Special Snowdrops’ by Jim Almond. Jim confessed to being a galanthophile and as well as collecting, growing and propagating snowdrops he gives lectures in many countries. We learnt that there are 21 cultivars and over 3000 species of snowdrop. Jim’s very interesting and informative talk was accompanied by slides and he managed to show photographs of approximately 60 different cultivars. Jim told us of the dependable snowdrops guaranteed to return every year, the ones with yellow markings due to low chlorophyll, the unusual and special and the doubles. He also showed snowdrops with 6 outer petals instead of three. Many of the cultivars have bigger flowers than the common Galanthus nivalis and he had brought some beautiful ones to show us. Jim’s rules are lift and divide and split clumps regularly, give some to a friend (insurance against loosing yours), propagate, grow some in pots and take photographs. He explained the technique to divide a clump and how to cut up bulbs to increase your stock. Seeds from your special snowdrops can be sown but will be different to to the parent. If you collect seeds sow immediately – you may get a new cultivar. We learnt so much from this talk and Jim had brought along some plants to purchase. The afternoon was spent drawing and painting – snowdrops.